Offers the same “features” as our Class Z pin gages but with .00004” tolerance limit and .00002” roundness limit. These pin gage sets are perfect for critical inspection needs or when you want to maximize your GO/NOGO tolerance limits. They’re also a great way to calibrate measuring equipment, micrometers and calipers. All gages and sets are traceable to N.I.S.T. Used as masters to calibrate measuring equipment and check linearity of comparators, micrometers, and calipers. 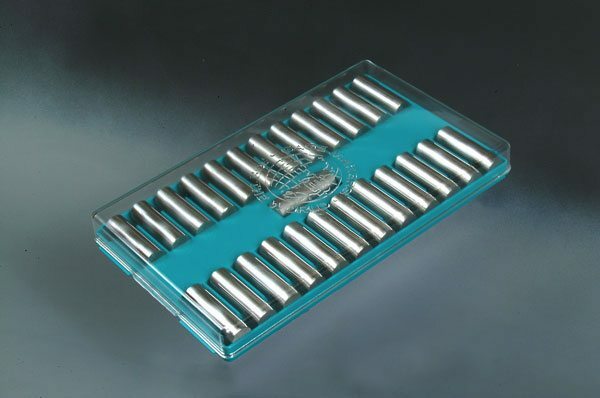 These “Tenth Step” pin gage sets have unlimited applications, such as quality control inspection, prototype work and production layout. Inspectors select from the range of pins to find the size of a hole or slot. These round masters simulate a cylindrical part which, unlike flat blocks, can detect uneven wear on the tips of micrometers and calipers. The thin “line” of contact detects uneven face wear better than flat gage blocks with large contact area. Each set contains 25 pieces of Class X tolerance (.00004”) gage pins. Traceable to NIST. All pin gages over .060” or 1. 51mm are laser marked with size direction of tolerance and serial number for traceability.